The Riverton Adult Knitting Group gets together every Thursday night from 6:30-7:30pm. The Burbank Knitting Group meets on the second Saturday of every month, from 10:30am-12:00pm. Our knitting groups are made up of members who enjoy socializing and sharing projects, patterns, and ideas. The groups are always open to new members, so please join us! Portland Public Library has a very well-developed knitting section offering inspiration readily at hand. Our staff has curated a list of favorites here. 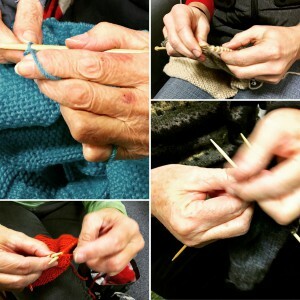 Location: Riverton Branch Audience: Adults, Seniors Bring in your knitting project for conversation and company as you work on your latest creation. Location: Burbank Branch Audience: Adults, Teens, Seniors Bring your latest project, and join us for conversation and inspiration! Newcomers and knitters of all skill levels are welcome!